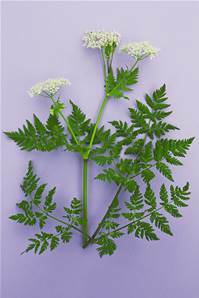 An introduced perennial with aniseed scented leaves. The leaves often have white blotches making the plant easily mistaken for Male Fern. The white flowers appear in May and the shiny black seeds last till autumn. Use the leaves with rhubarb to reduce tartness.